Back In The Gi » Blog Archive » Tying the knot (on your obi). Tying the knot (on your obi). 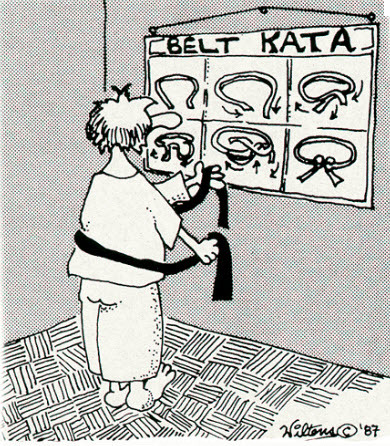 One of the first “techniques” that one must learn in karate is how to tie one’s belt (obi). Like most techniques, it can be rather confusing and counterintuitive at first but it becomes second nature with continued practice. Surprise, surprise: there are different ways to tie one’s obi and alternative explanations for why one should use one method or another. This video shows two of the most common methods (courtesy of YouTube user trosanelli). So, in this case, there is a “basic” method and an “advanced” method, but I will simply refer to them as the “crossed” versus “uncrossed” methods. The “crossed” method may be slightly easier for people to learn and it is simpler to get the ends of the belt to be the same length. However, it results in the belt crossing over on the back. The “uncrossed” method requires a bit more practice but it keeps the belt from crossing over at the back. I use the uncrossed method. I was taught previously that the belt should not cross at the back, as this looks “less disciplined”, but I think it is mostly a matter of preference that probably varies from dojo to dojo and student to student. What about the direction of the final knot? The video indicates that this should be open to the left (i.e., “toward the heart”, in folk anatomy), symbolizing an open heart to the martial arts. Funny thing is, I was taught the opposite: the knot should “point toward the heart”. 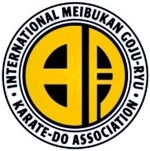 My new dojo uses the “open toward the heart” approach, so I will have to re-train myself to tie it with the knot facing in the opposite direction. However, I don’t think I will switch to the “crossed” method unless this is required, as I do tend to prefer the clean look of an uncrossed obi. Crossed, uncrossed, open toward heart, pointing toward heart. Even at the most basic level — getting dressed to start training — there are slightly different methods and explanations for why one should do one or the other. My advice is to do whichever your Sensei instructs you to do or whichever you prefer if there are no specific instructions in your dojo. However, one universal is that you should ensure that the ends of your belt are the same length on both sides so that you will not look sloppy. In the end, it’s what’s inside the belt that counts.